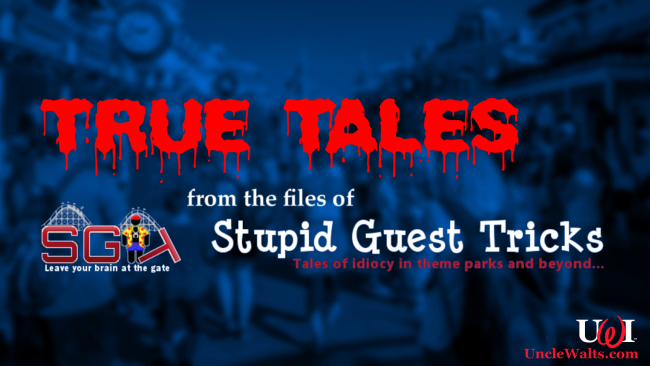 Now that Uncle Walt’s Insider has completed its hostile takeover of Stupid Guest Tricks, we can bring you some of our favorite stories that have been collected there over the years. Previous installments: Part 1, Part 2, Part 3, & Part 4. Where exactly are these other castles? Yesterday, as I walked across the Esplanade [between Disneyland and California Adventure], a woman stopped me to ask what time pyro was and where she should watch it from. 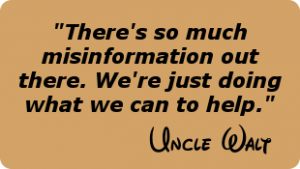 What do you do for Disney? I am not a Cast Member, but I am often mistaken for one — probably just because look like I know what’s going on. So I’ve basically just denied working for Disney, but these guys are still convinced that I do. They must think “cast member” is just one position, and I must work for the Mouse in some other job. A number of sharp responses to the “What do I do for Disney?” question flash to mind, the most obvious being “give them my money and visit their parks,” but I try to be nice. So I clarify that I am a guest, not employed by Disney in any sense. They still don’t seem to get it, and wander away quietly. I’m not quite sure how they think a Cast Member would be soaking wet and with older and younger family, but as I said, it happens a lot.